Under the Pink is the second studio album by singer-songwriter Tori Amos. Upon its release in January 1994, the album debuted at #1 on the UK Albums Chart on the back of the hit single "Cornflake Girl", and peaked at #12 in the US. The album was certified double Platinum in the US by the RIAA in October 1999, for sales exceeding 2 million copies. It was the 61st highest-selling album of 1994 in the UK and was certified platinum by the BPI in February 2007, for sales exceeding 300,000 copies. Under the Pink was included in Blender magazine's list of 500 CDs You Must Own, and was voted among the greatest albums of the 1990s by Rolling Stone magazine some years later. A special double-disc tour edition was released exclusively in Australia and New Zealand in November 1994, titled More Pink: The B-Sides. While several soft-loud-soft tunes betray a clear debt to Nirvana-style grunge, overall this album represents a more acoustic piano-based sound, and most of the final third of the album is devoted to a classical-inspired suite of piano songs, including the sweeping nine-and-a-half minute epic "Yes, Anastasia". Amos used a prepared upright piano for the studio recording of "Bells for Her", which was also played on a prepared piano for the second half of the tour. Amos has described the meaning of the song "Yes, Anastasia" to the media. The song is about the life of Anastasia Romanova, a grand duchess of Russia who was the daughter of Tsar Nicholas II. Amos explained that she had once become sick from eating bad crabs in Maryland. She explained that while performing a sound check, she was influenced by Romanov's presence. "Needless to say, when you are very, very ill, it is easier to communicate with your source ... you are fragile and vulnerable ... Now I have only heard of her story, I've got no point to make. She comes and goes 'You've got to write my tune.' I go 'Ohhh, now's not a really good time.' She says 'No, you've got to understand something from this, there's something here that you've got to come to terms with.' And that night came." Amos said that the lyrics "We'll see how brave you are" means so many different things to her; it is a part of her self saying "If you really want a challenge, just deal with yourself." Amos performed the Under the Pink tour from February through November 1994, encompassing many of the same stops as on the previous world tour. A limited edition release of the album commemorating the Australian tour included a second disc entitled More Pink, a collection of rare B-sides like "Little Drummer Boy" and a cover version of Joni Mitchell's "A Case of You", was issued in November 1994. During this period, she also contributed the song "Butterfly" to the soundtrack for the 1994 movie Higher Learning, as well as a cover of the R.E.M. song "Losing My Religion". The album was recorded in Taos, New Mexico in a hacienda. The album artwork features several Native American and New Mexican references in the photography. The album is also notable as the last Amos album to feature the production of Eric Rosse as they split that year. To date, Under the Pink remains her highest-charting album in the UK and has sold more than two million copies worldwide. All tracks written by Tori Amos. "There were certain songs that were supposed to be on the record that got kicked off. 'Honey' was supposed to be on the record and, in retrospect, I wish it had been. I kicked it off for 'The Wrong Band'. Under the Pink wept when 'Honey' wasn't on, and she still is angry with me about it." Amos made a similar reference to the song "Here. In My Head" which was originally featured as a B-side to the UK single of "Crucify". Under the Pink produced four singles. "Cornflake Girl" was released as the first single from the album in Europe (January 1994) and Australia (February 1994), and as the second single in North America (May 1994). It became Amos's biggest international hit at the time, peaking at #4 in the UK. "God" was released as the first single in North America in February 1994, where it became her first Billboard Hot 100 chart entry, peaking at #72. "God" was released as the second single from the album in Australia in May 1994, and as the fourth single in Europe in October 1994. "Pretty Good Year" was released as the second single in Europe in March 1994 and the fourth single in Australia in November 1994, but was not released as a single in North America. "Past the Mission", featuring backing vocals from Trent Reznor of Nine Inch Nails, was the third single from the album in all territories, released in Europe in May 1994, Australia in July 1994, and North America in September 1994. In singles "Cornflake Girl" and "God" B-sides were songs: "Sister Janet", "All The Girls Hate Her" and "Over It" (piano suite). In the US CD Single "Cornflake Girl" (with different artwork) were radio edit of song "Cornflake Girl" and song "Honey", which was kicked off the record at the last minute (song "Honey" was yet in the UK CD Single "Pretty Good Year"). In the UK CD Single "Cornflake Girl" Limited Edition were cover versions of songs "A Case of You" by Joni Mitchell, "If 6 Was 9" by Jimi Hendrix and "Strange Fruit" by Billie Holiday. In the UK CD Single "Pretty Good Year" B-sides were songs: "Home on the Range – Cherokee Edition" and "Daisy Dead Petals" ("Daisy Dead Petals" was yet in the US CD Single "Cornflake Girl"). In singles "Pretty Good Year" and "Past the Mission" B-side was song "Black Swan". The double-disc version of Under the Pink was released on November 14, 1994 by East West to coincide with Amos's tour of Australia and New Zealand. The second disc, titled More Pink: The B-Sides was never released separately, and is a rarity amongst Tori Amos collectibles. Amos would not release another collection of B-sides until 2006's A Piano: The Collection. The packaging simply inserted the normal Australian release of Under the Pink in a double jewel case, and altered the back insert artwork so that instead of being blank it featured the track listing of the second disc as well as production information for the songs. The title More Pink may be misleading, as many of the B-sides on the disc did not come from Under the Pink singles but in fact from the 1992 album Little Earthquakes, and in one case, from a Christmas compilation. The length of this disc is 48:49. The double-disc set entered the Australian ARIA Charts Top 100 Albums chart on the week ending 11 December 1994, peaking at #44 and spending 6 weeks on the chart. However, it was listed on the chart as a re-entry of Under the Pink, with its weeks spent charting added to the 21-week tally achieved earlier by the album. All tracks written by Tori Amos except track 1 (Joni Mitchell) and track 11 (traditional). Tori Amos – piano, vocals, producer; Vox organ on "Past the Mission"
^ a b c "BPI > Certified Awards > Search results for 'Under the Pink' (from bpi.co.uk)". British Phonographic Industry. Retrieved 2016-04-09. ^ Raggett, Ned. "Under the Pink – Tori Amos". AllMusic. Retrieved August 10, 2015. ^ Webber, Brad (February 10, 1994). "Tori Amos: Under the Pink (Atlantic)". Chicago Tribune. Retrieved August 10, 2015. ^ Sandow, Greg (February 4, 1994). "Under the Pink". Entertainment Weekly. Retrieved August 10, 2015. ^ Rosenbluth, Jean (January 30, 1994). "Tori Amos 'Under the Pink' Atlantic". Los Angeles Times. Retrieved August 10, 2015. ^ "Tori Amos: Under the Pink". NME: 40. February 5, 1994. ^ Walters, Barry (April 16, 2015). "Tori Amos: Little Earthquakes / Under the Pink". Pitchfork. Retrieved April 16, 2015. ^ Ramon, Alex (June 2, 2015). "Tori Amos: Little Earthquakes / Under the Pink (reissues)". PopMatters. Retrieved June 20, 2015. ^ St. Leger, Marie Elsie (February 24, 1994). "Under The Pink". Rolling Stone (676). Retrieved August 10, 2015. ^ Edmonds, Ben (2004). "Tori Amos". In Brackett, Nathan; Hoard, Christian (eds.). The New Rolling Stone Album Guide (4th ed.). Simon & Schuster. pp. 17–18. ISBN 0-7432-0169-8. ^ "Official Albums Chart Top 100 > 06 February 1994 – 12 February 1994". The Official UK Charts Company. Retrieved 2016-04-09. ^ a b "Billboard > Artists / Tori Amos > Chart History > Billboard 200". Billboard. Retrieved 2016-04-09. ^ a b "RIAA > Gold & Platinum > Tori Amos". RIAA. Retrieved 2016-04-09. ^ UCLA Interview Archived 2010-01-16 at the Wayback Machine, UCLA Interview. ^ Under the Pink: Song Book, Under the Pink: Song Book. ^ "Under the Pink (Deluxe Edition)". Amazon.com. February 2014. 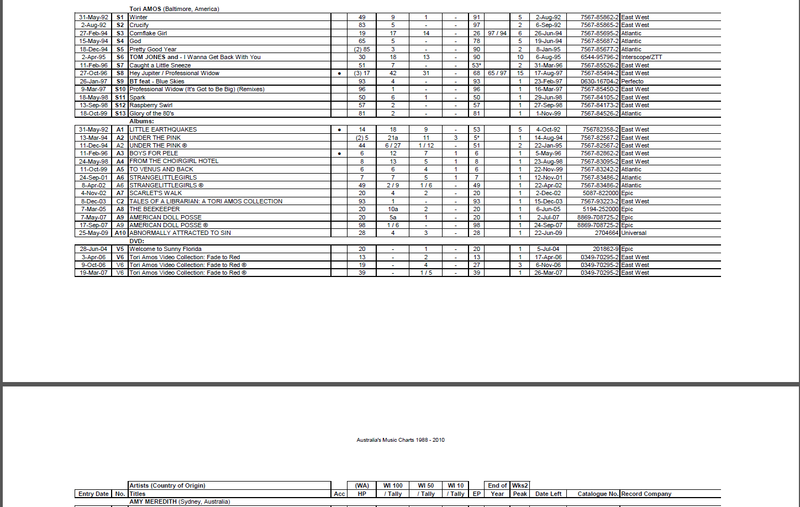 Retrieved 2015-02-01. ^ "Bee-Sides". yessaid.com. Archived from the original on 2009-06-25. ^ "Bee-Sides". yessaid.com. Archived from the original on 2011-07-18. ^ a b c d e f "Official Charts > Tori Amos". The Official UK Charts Company. Retrieved 2016-04-09. ^ a b "Billboard > Artists / Tori Amos > Chart History > The Hot 100". Billboard. Retrieved 2016-04-09. ^ "ARIA Report > New Releases 14th November 1994 (from the ARIA Report Issue No. 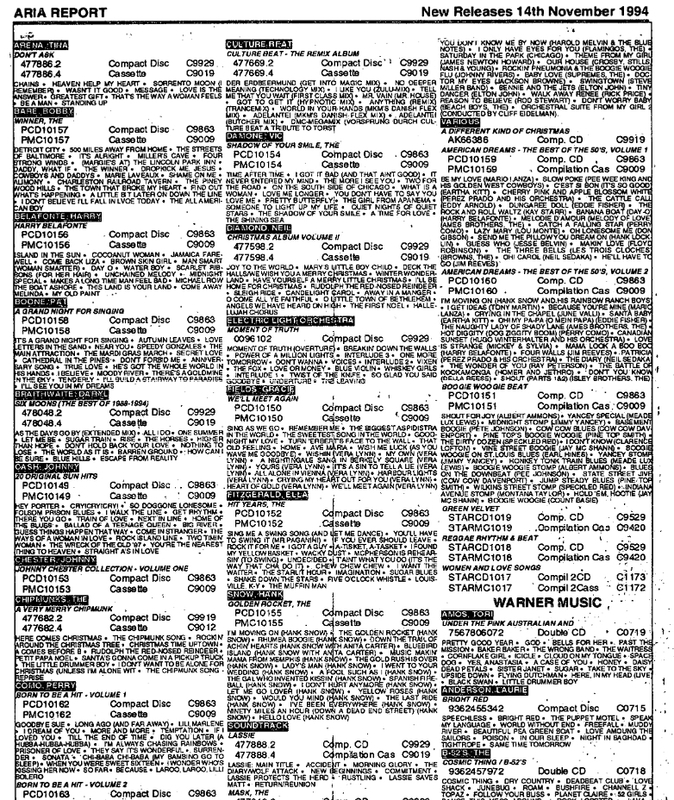 248 – Week Ending 13th November 1994)". ARIA. Retrieved 2016-04-09. 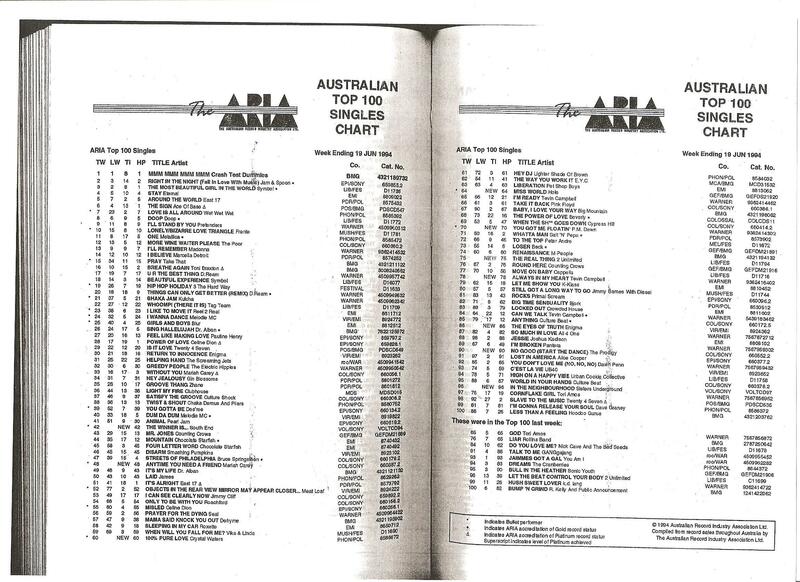 ^ a b "Screen shot from Gavin Ryan's Australia's Music Charts 1988–2010 book". Mt. Martha, VIC, Australia: Moonlight Publishing. Retrieved 2015-11-12. ^ "australian-charts.com > Tori Amos – Under the Pink (album)". Hung Medien. Retrieved 2016-04-09. ^ "austriancharts.at > Tori Amos – Under the Pink" (in German). Hung Medien. Retrieved 2016-04-09. ^ "Offizielle Deutsche Charts > Tori Amos – Under the Pink (album)" (in German). GfK Entertainment. Retrieved 2016-04-09. ^ "dutchcharts.nl > Tori Amos – Under the Pink" (in Dutch). Hung Medien. Retrieved 2016-04-09. ^ "charts.org.nz > Tori Amos – Under the Pink (album)". Hung Medien. Retrieved 2016-04-09. ^ "swedishcharts.com > Tori Amos – Under the Pink (album)". Hung Medien. Retrieved 2016-04-09. ^ "hitparade.ch > Tori Amos – Under the Pink" (in German). Hung Medien. Retrieved 2016-04-09. ^ "Australian Charts > Tori Amos – Cornflake Girl (song)". Hung Medien. Retrieved 2016-04-09. ^ "Offizielle Deutsche Charts > Tori Amos – Cornflake Girl (single)" (in German). Retrieved 2016-04-09. ^ "The Irish Charts – All there is to know > Search results for 'Cornflake Girl' (from irishcharts.ie)". Fireball Media. Retrieved 2016-04-09. ^ "dutchcharts.nl > Tori Amos – Cornflake Girl" (in Dutch). Hung Medien. Retrieved 2016-04-09. ^ "charts.org.nz > Tori Amos – Cornflake Girl (song)". Hung Medien. Retrieved 2016-04-09. ^ a b "Billboard > Artists / Tori Amos > Chart History > Alternative Songs". Billboard. Retrieved 2016-04-09. 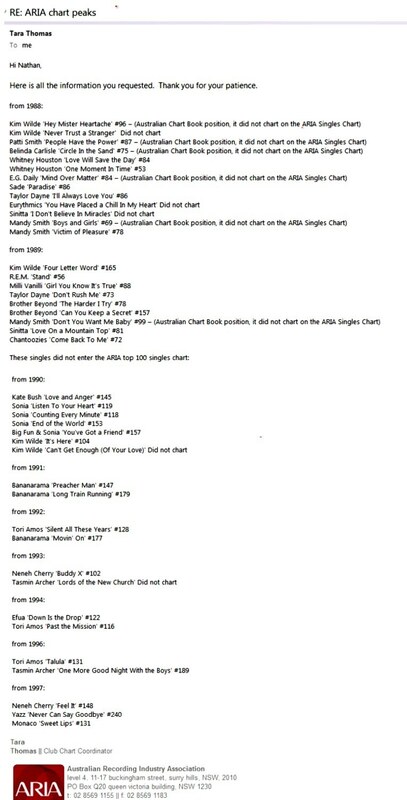 ^ "The ARIA Australian Top 100 Singles Chart – Week Ending 19 Jun 1994". ARIA. Retrieved 2016-04-09. 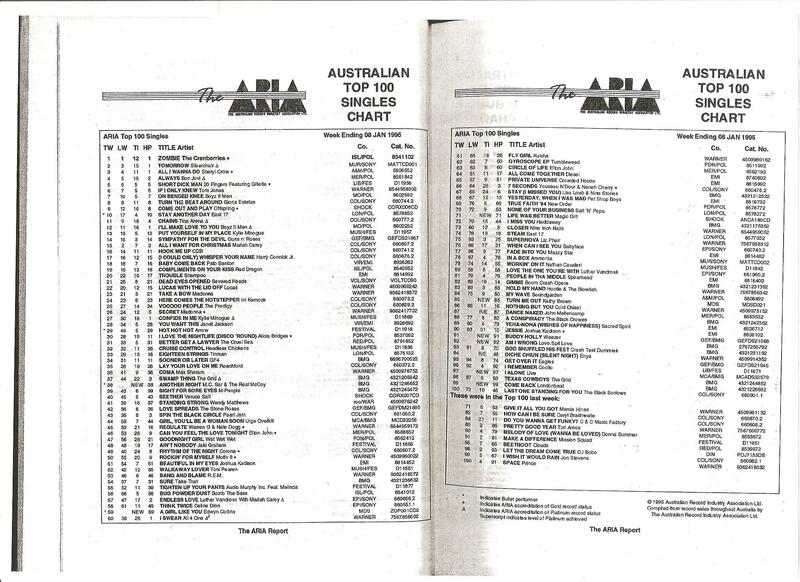 ^ "The ARIA Australian Top 100 Singles Chart – Week Ending 08 Jan 1995". ARIA. Retrieved 2016-04-09. ^ "The Irish Charts – All there is to know > Search results for 'Pretty Good Year' (from irishcharts.ie)". Fireball Media. Retrieved 2016-04-09. ^ "Response from ARIA re: chart inquiry, received 2014-06-17". imgur.com. Archived from the original on 2014-11-29. Retrieved 2016-04-09. 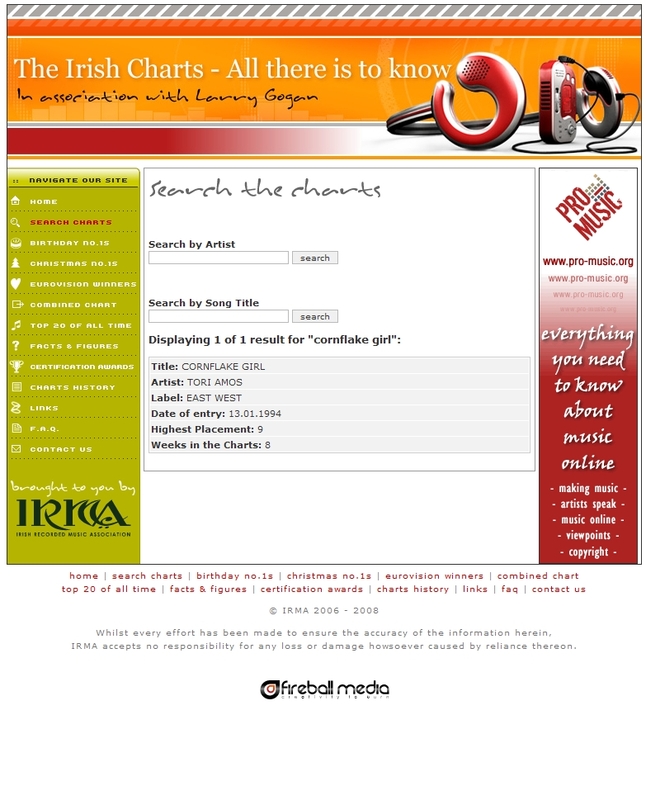 ^ "The Irish Charts – All there is to know > Search results for 'Past the Mission' (from irishcharts.ie)". Fireball Media. Retrieved 2016-04-09. ^ "Canadian album certifications – Tori Amos – Under the Pink". Music Canada. 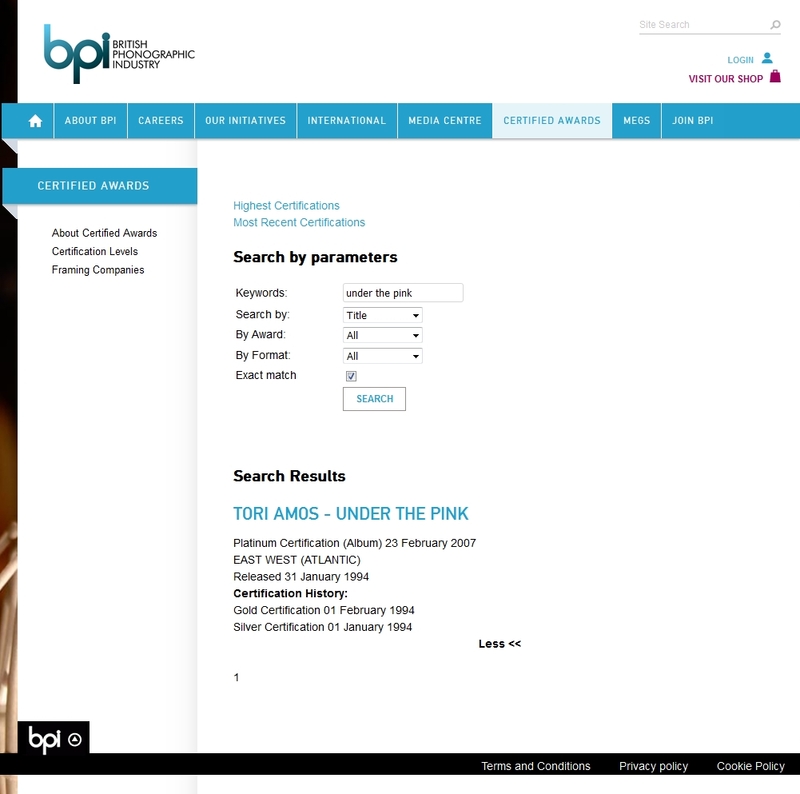 ^ "Dutch album certifications – Tori Amos – Under the Pink" (in Dutch). Nederlandse Vereniging van Producenten en Importeurs van beeld- en geluidsdragers. Enter Under the Pink in the "Artiest of titel" box.